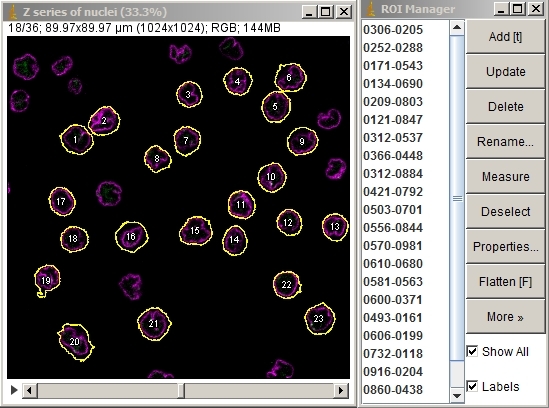 This page describes marking a field of isolated cells in a Z series such that each cell is individually made into a 3D movie and the movies are montaged into a single stack. Alternatively, the marked cells themselves may be extracted and montaged as a stack without the 3D processing. 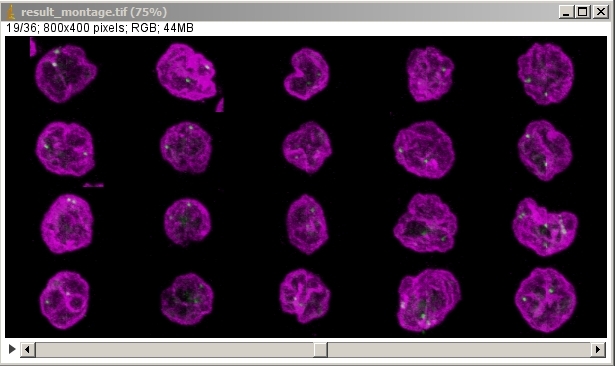 To export each cell as its own individual Z series, run "clip all ROIs in Roi Manager each as a stack [F4]" in crop_and_montage_stacks_v100.txt or to make a 3D rotation of each cell as pictured below, run "pull all Z series from two windows, merge, and 3D" in quick_3D_macro_v100.txt with the appropriate window names inserted into the macro. Click here for the resulting stack.